In this guide you're going to learn about all of the different types of risk free Casino offers that are available. There are plenty of offers with positive value out there, however most of them come with an element of risk as you will have to wager your own funds. We've made a completely separate guide for these type of offers that range from low risk to high risk here. So if you're wanting to just attempt the risk free offers and not risk any money whatsoever, then read on! Before attempting any casino offer it's important to understand what wagering requirements are. A "wager" is simply a bet and so wagering requirements just means how much you need to bet, or wager, in order to complete the offer. Lets say you receive a £5 bonus with 10 times wagering on the bonus. This means that in order to finish the promotion and withdraw all winnings, you must bet a total of £50 (£5 bonus x 10 = £50). Now £50 might seem like a lot to bet, however you don't need to place it all in one go! The strategy to over come wagering requirements is place the smallest possible bets. So in this example you might open up a slot machine and start doing 25p spins until you've wagered £50. If you did 200 spins at 25p a spin then that would equal a total of £50 wagered and so the offer would be complete and you could withdraw all winnings. Wagering requirements can be put on bonuses, winnings, or not required at all. In the example above the wagering requirements were on the bonus, so you receive a bonus and have to wager a certain amount before you can withdraw it. Other times you might get free spins and have to wager the winnings a certain amount of times, for example 5x winnings on free spins - if you win £2.00 then you have to wager £2.00 5 times, so £10 before withdrawing. A lot of free spin offers come with no wagering requirements though - these are simply free money! Free spins are the most popular type of Casino offer as you have a risk free chance at winning some money. They aren't always guaranteed profit and some come with a hefty wagering requirement on winnings, however they're generally really quick to do and if you follow the right strategy then it'll be worthwhile when you hit a big win. Whenever you load a slot and have free spins on it you will receive a pop up similar the ones above. Simply click on the Free Spins icon to claim them and a bar will pop up similar to the one below, showing you how many spins you have and how much you've won. After you've spun your free spins, the winnings will either go into your cash balance or they'll have wagering requirements. The wagering is normally something along the lines of 30x winnings. So if you won £2 you'd have to wager £60 before you can withdraw anything. Obviously this is quite a large amount so you should use the "go hard or go home" strategy. Some people will like to sit there and do 25p spins and try to grind it out however I'd recommend just simply doing a £2 spin. Either you lose it (which you will most of the time), or you will win a decent amount which should allow you to complete the remaining £58 wagering and withdraw a profit. Bonuses are slightly different to free spins as they have an actual numerical value. In the example earlier on you had a £5 bonus that has to be wagered 10 times. It's similar to winning £5 from free spins that have to be wagered 10 times. The same sort of strategy is adopted - I'd opt to do maybe 2 x £2.50 spins or 1 x £5 spin. You know if you win anything over say £20 you'll be in a good position to complete wagering and can reduce your stake, however if you were to just do 25p or 50p spins you might get through 80% wagering and still bust, so to save time it's always best to do higher value spins. There are plenty of free bonuses and free spins kicking about every week however finding them can be tiresome. The best place to find them is on Oddsmonkey, either by going to the Casino Welcome Offers page or by visiting the Oddsmonkey Forum. The welcome offers page will have a list of new casinos to sign up to, and the forum will include a larger list as it contains offers other people may have found and daily bonuses/spins. Above is a screenshot of the casino offers page. There are over 20 welcome offers for casinos that give you free spins or bonuses without any deposit needed. Alternatively there may be a deposit needed for some, but your deposited funds do not need to be wagered so it is still risk free. 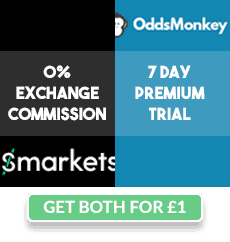 You can see a full list in the Oddsmonkey Casino Welcome Offers. There are usually 5 to 10 Weekly Offers worth £10 profit/week or £50/month which simply give you free spins or money back as cash. You can see these in the OddsMonkey Calendar or in the Latest Offers forum like below. Cashback websites like Topcashback and Quidco will offer you money, paid as cash, for signing up to certain casino sites. The amount you can make from cashback sign ups is in excess of £300 and so definitely worth doing! It's very simple - you sign up through Topcashback or Quidco and wager X amount and they will pay you Y amount. The amount you have to wager is normally lower than the amount paid making it risk free. For example you might sign up to 32red casino and wager £10, and receive £11 cash back. You're guaranteed £1 profit here however will most likely make in the region of £9-£10 profit! Please check out our dedicated Cashback Guide for more details and the latest offers.